Do you feel lost in Budapest, like Chico Burque in his book, and only a martini can save your life? 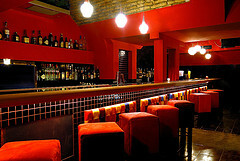 If so, the Boutiq’Bar is the place you are looking for. The bar is intimate but full of life and laughs, classy but modern, local but international, and most of is the place where the bartenders will be treating you perfectly. Just as for a classic matrtini, or let yourself be taken through a more creative cocktail journey: in both case you will not be disappointed. All in all, this is one of those bars that are diffcult to be forgotten. Classic Martini rate: 8/10.